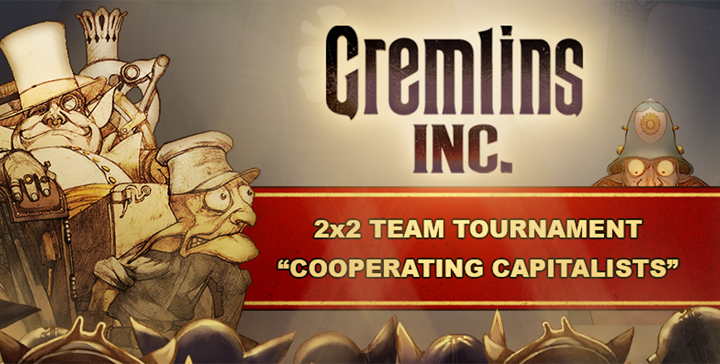 The community team tournament "Cooperating Capitalists" is over and we would like to summarize the results. Despite the high number of teams, the cooperative attitude of all the participants allowed us to complete the whole event in just 2 weekends – during which 32 tournament sessions were played. It's worth noticing that the competing teams were not just responsible, but also friendly to each other and ready to sacrifice their own comfort in favour of that of their opponents. To satisfy the needs of some teams, several sessions were moved to different starting times or even to another server. Overall, the tournament had no significant delays and not a single session was canceled! Without a doubt, the organizers of this team tournament deserve a special mention: extenion, jack_was, Meowth, Impsuley, Standard of Ur & winter1703. Without them, this event wouldn't have happen! despite the predictions, the Lithuanian team The Dudes and team The Krits, which united players from the UK and Portugal, were able to make it to the second round. team The Krits won again, in a session against team OHAGI, although according to the preliminary predictions on Discord, its chances to lose were 23:2. After that victory, no Japanese teams remained in the tournament. The Krits who finally got the predictions on its side, lost to the team love revenge. similar situation happened with team of dog which has won in the session against love revenge while predictions were 7:3 against it. Only the finals of the tournament, that happened on April 7, were played accordingly to expectations: love revenge has defeated BLACK MOON in the session for the third place, and cidanzi has won the title of the champion with two victories in a row in the final series against team of dog. All tournament results and the full tournament ladder can be found through this link[docs.google.com]! * Fastest Victory (by rounds): 33 rounds. Teams team NF and May there be CHAOS! * Biggest Score (individual): 35 points. MrBrightside from Watchdogs of Farron and Privet20 from May there be CHAOS! * Biggest Score (team): 59 points. jack_was: For how long do you play the game? 陈年老酱: I have played for 512 hours, my teammate 瓷蛋子 has played for 690 hours. jack_was: How did you like "Cooperating Capitalists" tournament? 陈年老酱: It was my first time joining an official team play tournament. I like to play with my friend and win together. jack_was: What rules did you like and which ones would you like to be adjusted? 陈年老酱: I think the rules are fair enough. Maybe the "random character" rule will make me play a character which I don't like to use but some characters will be too strong if they are in the same team – like the Damned and the Pauper. jack_was: Which session was the greatest challenge for your team and why? 陈年老酱: every team was a challenge but if I had to choose, I think it would be session 26 against May there be CHAOS! (Privet20, Kieli). the Banker got 106 income at the 14th turn. The Pauper got The Accelerator at the 17th turn. fn: this session was recorded and you can watch it here. jack_was: There were 5 teams representing China in quarter-finals and you allowed no other countries to enter semi-finals. Is there any simple explanation? 陈年老酱: the winner needs both luck and skill – nothing else can be said here. It's a rare situation that happened this time, and you probably won't see this happening in the next tournament. Also, I don't have permission to "allow" anyone to enter semi-finals or something. To enter the semi-finals you just need skill and luck. Once again we would like to express our gratitude to everyone who organized and conducted this tournament as well as to all the teams who participated (and those who were ready to participate but didn't get a chance even after the brackets were expanded from 16 to 32 teams). This was an amazing experience and we followed the course of the tournament with great interest making our own predictions. We will discuss possible ways to make such tournaments more regular, where the qualifying round to them will be the position of the players on the ranked ladder at the end of a season. Thank you, everyone, for playing our game and finding more and more ways to play it differently! @Sergei Klimov Thank you very much for hosting this contest successfully. I hope we can get a better place in the next contest. @陈年老酱, sorry about that, somehow I missed them. The news is fixed and the prizes are distributed. Thank you very much for pointing this out. "Biggest Score (team): 59 points: Team: cidanzi"
Emerging Oligarch team got 59 points at session 1, too. Fully agree. Communication is key! But also, the ability to think as a team. Where each player thinks about opportunities presented to both. We are lucky to have your team playing the game and we hope to see you at the next team tournament, in May! In fact I consider myself rather as a person who merely encouraged other Pillars of Community to organize team tournament so expected by some players. Apart from persons already mentioned in the announcement I want to express my graditude to game developers who supported this event. As the organizers we've learnt something new thanks to the participants who were so kind to share their opinions and remarks. I hope both knowledge and experience obtained will help in making future community tournaments even better. Thanks to all of you who registered their teams. The fact that we had to double the number of participants proves that there is undisputible demand for team tournaments. 陈酿老酱 is the best player I have met in my life.He is really good and helped us to get out off our worst situation.He inspired our willing to play p.s. (In that moment ,we was chatting in qq'voice from tencent,and we all said"what the ?The banker and the pauper are both too strong. ")In 2 vs 2 game,I say communication leads us to win. Indeed, performed the best in this format! One team could be luck, four teams is an objective proof!